The arrival of a new year offers the perfect opportunity to spruce up your home. Take a closer look at its most visible design components and decide which ones need work. Your windows, for example, might have sustained some wear and tear from the previous year. If you want them to add more to your home’s curb appeal, you should consider investing in window replacement in Michigan. You can turn to Kroll Construction for this home improvement project. We carry only the highest-quality selection of windows from Alside®, one of the country’s top manufacturers. Aside from these windows’ durability and energy-saving benefits, they come in a variety of lovely colors that can complement your home’s distinctive style. This is possible through Alside’s FrameWorks Color Palette. Making sure your Alside replacement windows in Michigan shine from the curb is worry-free with FrameWorks’ exterior color options. It offers many design possibilities, whether you prefer window units that command attention or blend in with your home’s exterior design. These color choices include Architectural Bronze, English Red, Desert Clay, Forest Green, and Castle Gray. All can offer a distinctive touch to your windows’ look with their matte texture, while providing the bonus of low-maintenance performance. In fact, our exterior color selection comes with exceptional resistance to dirt, chemicals, and environmental pollutants. This allows your new Alside windows to stand up to extreme cold and heat. Their excellent UV resistance also means their colors last longer than regular paint. 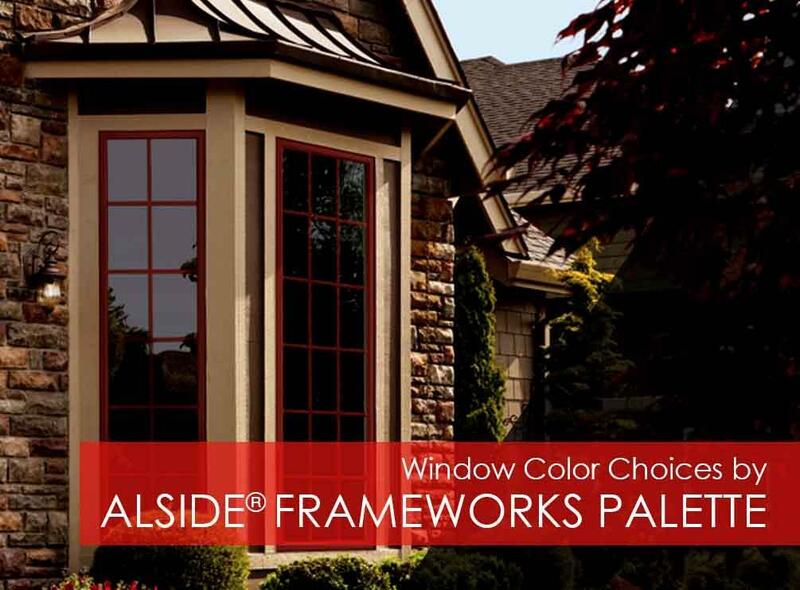 With FrameWorks Color palette from Alside, your windows can look great inside and out. Our interior color choices come in standard Solid White and Beige, plus elegant wood grain finishes in Soft Maple, Dark Oak, Cherry, and Foxwood. These lovely options come in handy if you’re aiming to preserve your home’s traditional look. Since your windows feature the rich tones and natural beauty of genuine wood, you no longer have to worry about the time-consuming maintenance involved with that material. Add a dash of color to your home with quality Alside units from Kroll Construction, one of the top window companies in Michigan. With its FrameWorks Color palette, upgrading your home’s look is stress-free. Call us today at (888) 338-6340 or fill out this form to get a free quote.